Get that vintage look for your trailer with this silver star-pattern trailer wheel. 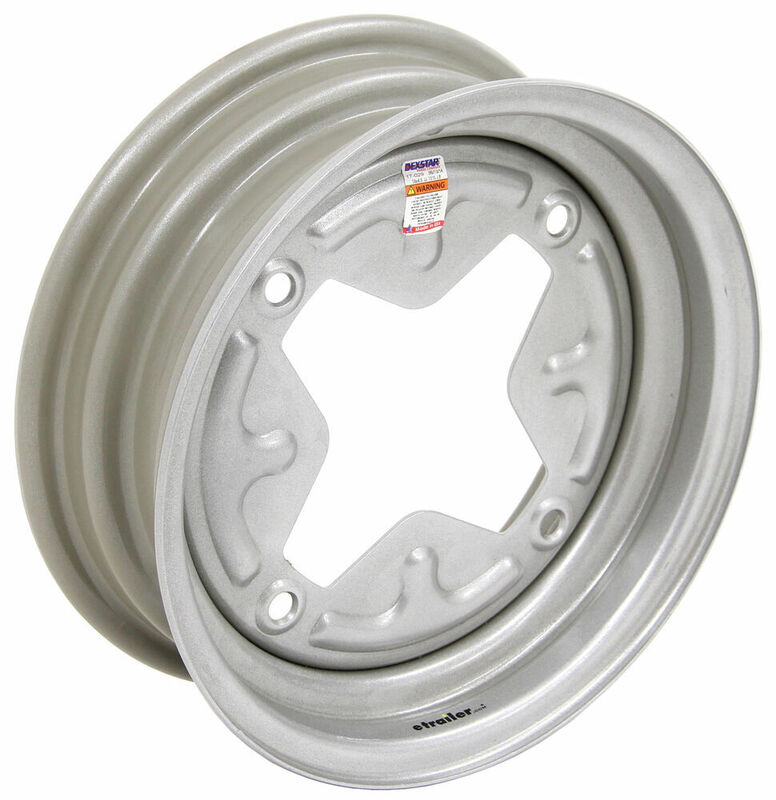 The 13" steel wheel features a 4 on 9.44 bolt pattern and meets Department of Transportation standards. Lowest Prices for the best tires and wheels from Dexstar. Dexstar Vintage Steel Wheel w/ +5 mm Offset - 13" x 4-1/2" Rim - 4 on 9.44 - Silver part number AM20208 can be ordered online at etrailer.com or call 800-298-8924 for expert service. Get that vintage look for your trailer with this silver star-pattern trailer wheel. 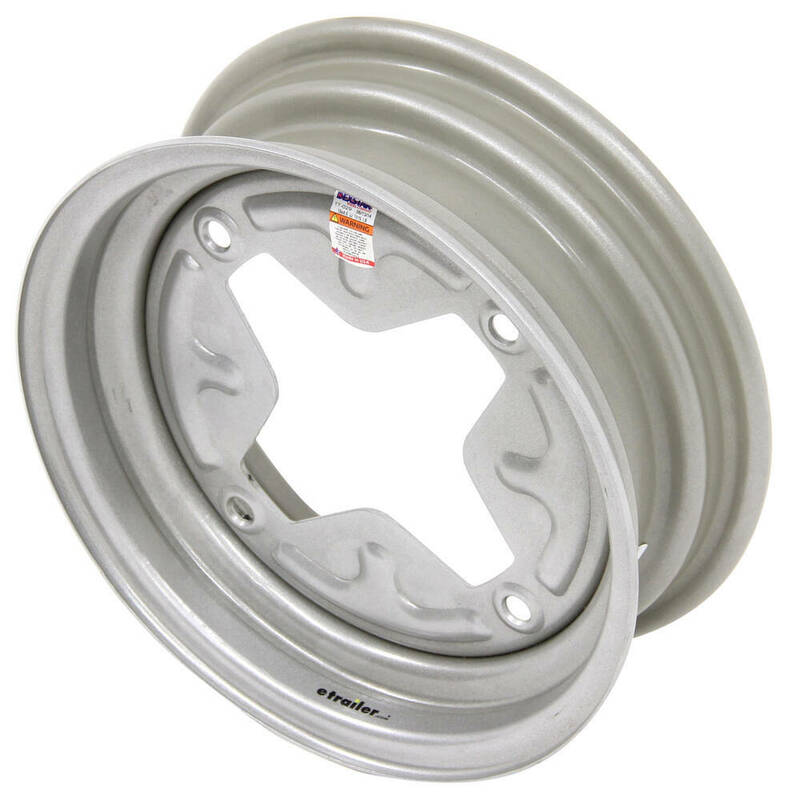 The 13" steel wheel features a 4 on 9.44 bolt pattern and meets Department of Transportation standards. Bolt pattern: 4 on 9.44"
The first number in the bolt pattern is the number of bolt holes. The second number denotes the diameter, in inches, of the circle on which the bolt holes sit. Measuring the distance from the center of one bolt hole on the wheel to the center of a bolt hole right next to it can also help to determine the bolt pattern. If D = 2-5/8", then the bolt pattern is 5 on 4-1/2"
If D = 2-3/4", then the bolt pattern is 5 on 4-3/4"
If D = 3", then the bolt pattern is 5 on 5"
If D = 3-1/4", then the bolt pattern is 5 on 5-1/2"
20208DX Dexstar Vintage 494 Steel Wheel - 13"
Today we're going to review part number AM20208. This is the Dexstar 13 by 4 and 1/2-inch vintage steel wheel with the 1/2-inch positive offset, and the 4 on 9.44 bolt pattern, and the silver finish. This wheel's a sturdy steel construction. It has nice excellent corrosion resistance because it uses a silver powder coat finish over an e-coat primer on the front and the back of the wheel. This is the star pattern, creates the vintage look. This vintage wheel is used on a lot of the older trailers. This wheel does have a positive offset, which ensures that the wheel's positioned closer to the trailer frame. This is a high quality wheel, which means it meets the Department of Transportation specifications, and this part is made in the USA. A few specs on this wheel. It is a 13-inch diameter, by 4 and 1/2 inches wide. When you measure the diameter and the width, you're actually measuring inside to inside because you're measuring where the tire would seat on this wheel. The tire beads would seat right here, so when you measure the width you're going to measure inside to inside, and when you measure the diameter it's inside to inside. To give you an idea of the diameter on this wheel, if we measure inside to inside, you can see right at 13 inches. The width, same way, we'll measure inside to inside, and you can see right at 4 and 1/2 inches. Now the bolt pattern, this is a older, vintage bolt pattern. It's measured, a bolt pattern would be measured, on a wheel that has an even number of lug holes, like this one's got four, you'll just pick one lug hole. Measure from the center of that lug hole to the center of the hole directly opposite from it. If you measure the bolt pattern on this wheel, center is going to be right at the 9.44, so this is a 4-lug on 9.44 bolt pattern. This does a use a wheel lug size of 1/2 inch by 20. It does have a load capacity of 1,315 pounds. Just to mention, this has a 1/2-inch positive offset. Basically, what that means is, most trailer wheels, the mounting surface, right here, that mounts onto the hub of the trailer is right at the center line, which would be 0 offset. Now, if this mounting surface, back here, would move towards the front of the wheel, which would pull the wheel closer to the trailer frame, that's the positive offset. This one has a 1/2-inch, so this mounting surface is from the 0 it moves a 1/2 inch this way, which will pull this wheel closer to the trailer frame. That should do it for the review of part number AM20208. This is the Dexstar 13 by 4 and 1/2-inch vintage steel wheel with the 1/2-inch positive offset, and the 4 on 9.44 bolt pattern, and the silver finish. Order: RelevanceNewestRating - High to LowRating - Low to High Get that vintage look for your trailer with this silver star-pattern trailer wheel. 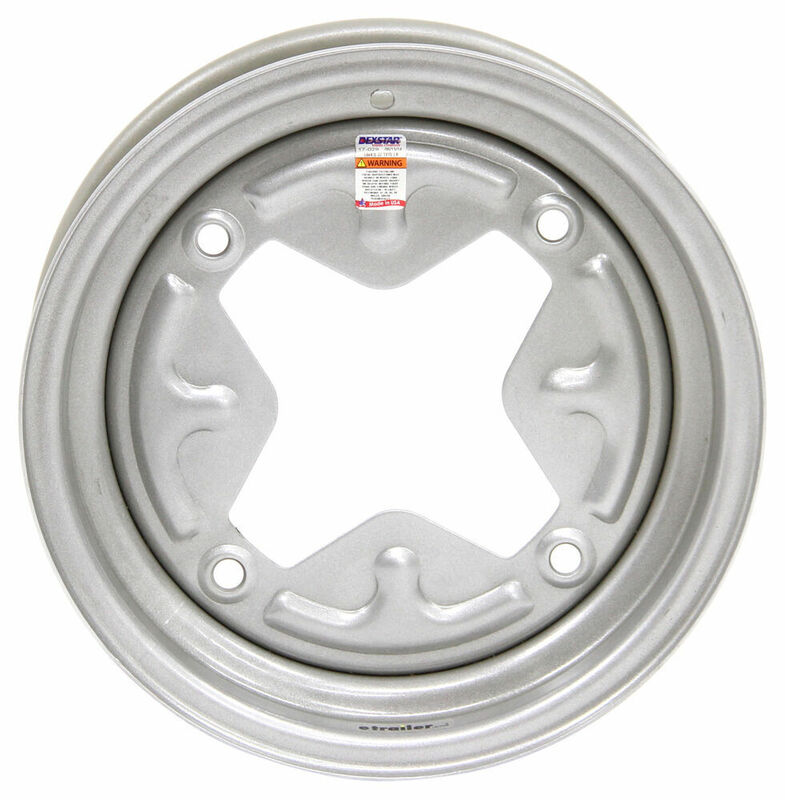 The 13" steel wheel features a 4 on 9.44 bolt pattern and meets Department of Transportation standards. Do you have a question about this Tires and Wheel? We do have wheels with both the 4 on 4 inch bolt pattern or the 4 on 9.44 inch like # AM20208 which I assume is the old style you are referring to. We have these in 13 inch, 14 inch, 15 inch options. I've linked the pages to assist. I've also attached an article on how to measure your bolt pattern to confirm a fit. Our wheels will work with lug studs or lug bolts. Let me know if you have further questions. We do offer replacement trailer wheels (rims) with the 4 x 9.44-inch bolt pattern, such as part # AM20501 from Dexter which is a 15 x 6-inch wheel. We also offer this bolt pattern in other wheel sizes; those part numbers are linked for you: # AM20208, # AM20312 and # AM20395. For this vintage style wheel we no longer have replacement hub/drum assemblies. At right is a link to all hub/drum assembly sizes we do offer. You might be able to use a vintage wheel if the center to center distance from one bolt hole to the other bolt hole of your existing wheels is 9.44 inches (a little over 9-7/16 inches). We have the following vintage wheels: 13 inch wheel # AM20208 14 inch wheel # AM20312 15 x 5 inch wheel # AM20395 15 x 6 inch wheel # AM20501 Take the measurement and you will know if this rim will fit. Feel free to email me a picture of your wheel as well. If the center to center bolt spacing of your existing wheels is 9.44 inches, and 4-1/2 inch wide wheels with a + 5mm offset would work with your trailer, the # AM20208 wheels would work well for you. Rather than having the wheel mounting pad (surface of the wheel that touches the hub) centered midway along the width of the wheel, the positive offset actually tucks the tire closer in to the trailer by 5mm. The ST175/80-D13 tire is the proper replacement size for your B78x13ST. It sounds like you are talking about a wheel such as # AM20208 which has a very rare and no longer used 4 on 9.44 inch bolt pattern. For a tire you will want the Karrier ST175/80R13 Radial Trailer Tire - Load Range D # AM10210. I attached a review video for this tire plus an FAQ on trailer tires for you to check out as well. We offer four vintage-style trailer wheels with the 4-on-9.44-inch bolt pattern that can be seen on the linked page. These wheels are available in 13-, 14- and 15-inch diameters. Note that all four of these wheels have a 5mm positive offset, meaning that the tire will be 5mm closer to the trailer frame that with a wheel having no offset. Weight capacities range from 1315-lbs for the 13-inch x 4-1/2-inch # AM20208 to 2330-lbs for the 15 x 6 # AM20501. Most likely what you would need is the part # AM20208 but you would need to measure first. You will need to measure from the opposite sides of the wheel bolt holes like in the picture I attached. If that measurement is 9.44 inches this rim would fit and work well for you. 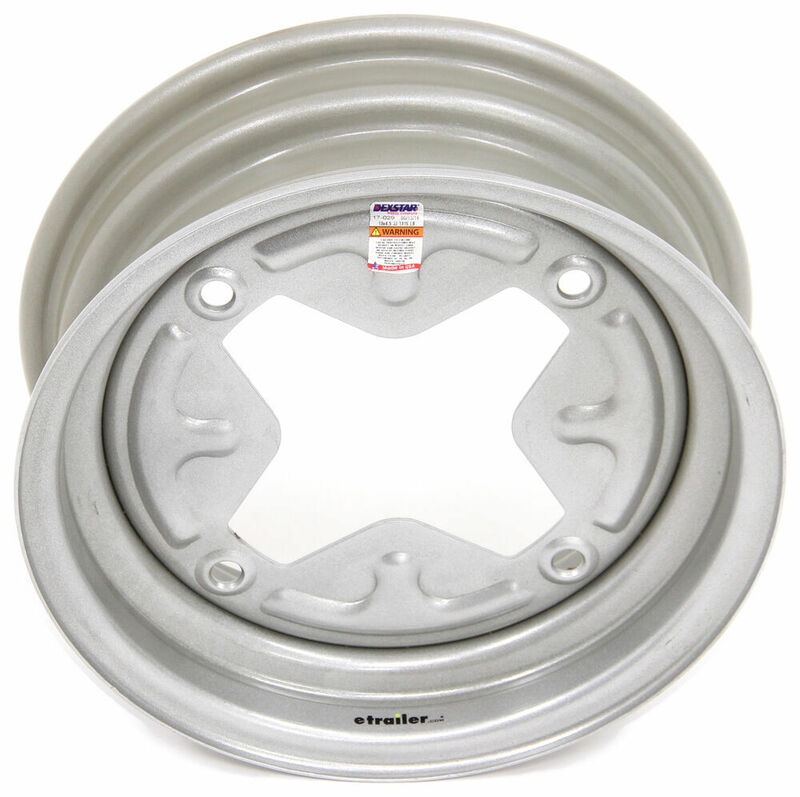 We do carry a wheel that will likely work for you, the Dexstar Vintage # AM20208 which is 13" diameter x 4-1/2" wide. Tires that are size 185/80-13 such as # the Loadstar # AM1ST79 will fit various size wheels that have a 13" diameter; for example this particular tire will fit 13" x 4-1/2", 13" x 5" and 13" x 5-1/2" wheels so this combination would work for you. I have added a link to a video review of the wheel for you to take a look at as well. The Dexstar Vintage Wheel part # AM20208 that you referenced is a 13 inch diameter wheel that take a 13 inch tire. A popular option that a lot of people go with when purchasing this rim is the # AM10210. I attached a review video for this tire plus an FAQ on trailer tires for you to check out as well. You would need to measure the bolt pattern of the hub you have on your trailer to know for certain. The Dexstar Vintage Steel Wheel # AM20208 has a bolt pattern of 4 on 9.44 inches. You would need to measure from one wheel stud to the one directly across from it. If that measures 9.44 inches the rim would be the correct size. A popular tire for this rim is the part # AM10210 which is a radial ST175/80R13. The width of a rim is measured from the inside bead of the rim. I have attached a photo and have noted where the measurement is taken. The Dexstar Vintage Steel Wheel, part # AM20208 measures 4-1/2 inches wide at the points I have noted on the photo. I have attached a helpful video for you that explains where measurements are taken on wheels. Highest quality tires and wheels for the best price. Most detailed, accurate tires and wheel information available.